The beauty of the ICC Cricket World Cup is that looking back to the history of the previous eleven editions is even more exhilarating than looking forward to the 2019 edition, to be hosted by England and Wales between May 30 and July 14. This official publication by Carlton Books, is a quality production and is sure to bring back some of the most emotional events to have taken place in the history of World Cup. Before this publication, Chris Hawkes had edited the bestselling Cricketer's Who's Who annual for many years and went on to write a number of books, including, for Carlton, the Cricket World Cup Guide 2007, Rugby World Cup Guide 2011, World Cricket Records, The Ryder Cup and 1,001 Sporting Records. Chris Hawkes believes that thanks to his fearless approach to batting, Virat Kohli has become "one of the most admired players in world cricket and he cemented that perception when he played a pivotal role in India's march to the ICC Cricket World Cup crown in 2011. But it is as India's captain that he has garnered the most admirers. He has transferred his intense passion and work ethic onto the Indian side, helping them become one of the most complete teams in world cricket." Kagiso Rabada has been described by Hawkes as the best fast bowler South Africa has produced in recent years. "Now the spearhead of an inexperienced South Africa attack, if the Proteas are to end their wait for an ICC Cricket World Cup victory, much will depend on the performances of Kagiso Rabada." According to the Chris Hawkes, "the 2011 World Cup was going to be Sachin Tendulkar's last ICC Cricket World Cup: what better way for the game's biggest icon to bow out than to win the game's biggest prize in his hometown stadium? The dream had come true, and the sight of Sachin being carried around the stadium on his team-mates' shoulders is one of the ICC Cricket World Cup's most-enduring moments." 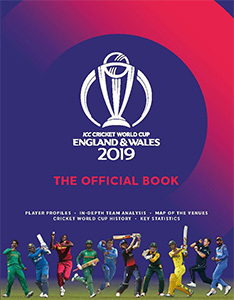 Apart from the history of each World Cup from 1975 to 2015 and the key stats, the book comprises description of the cities and grounds, hosting the matches and their star performers. It contains everything cricket enthusiasts need to follow and enjoy the competition, the World Cup. Beautiful written, attractively laid-out and logically organised, ICC Cricket World Cup England & Wales 2019 is an outstanding production indeed. The feature of the book is its superb collection of photographs, taking it to another level of excellence. An indispensable companion, the book is a must for every cricket lover.